Planning a Disney cruise vacation? 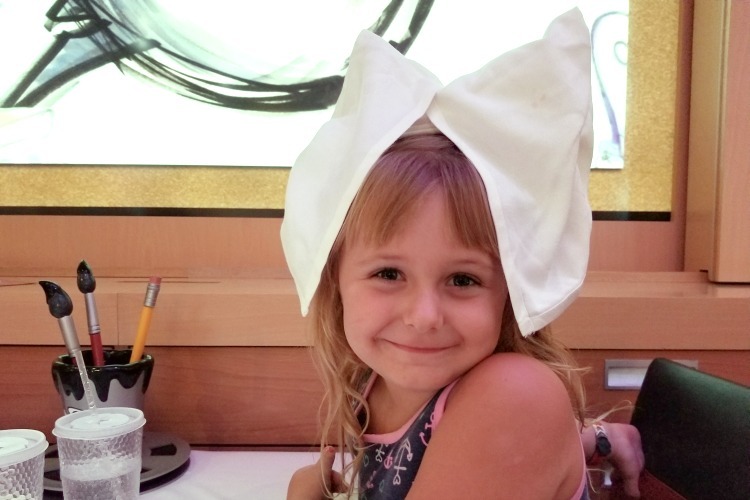 Dining on the Disney Dream may just be the best part of your trip. From chatting with Crush the sea turtle at Animator’s Plate to the not-so-hidden glass slippers at the Royal Palace, there’s a lot you may not know about the Disney Dream restaurants. Find out how Disney turns dining into a magical experience and what three words put a smile on every child’s face. One of the best parts of any Disney cruise is the food and if you’re planning a vacation aboard the Disney Dream, you won’t be disappointed. 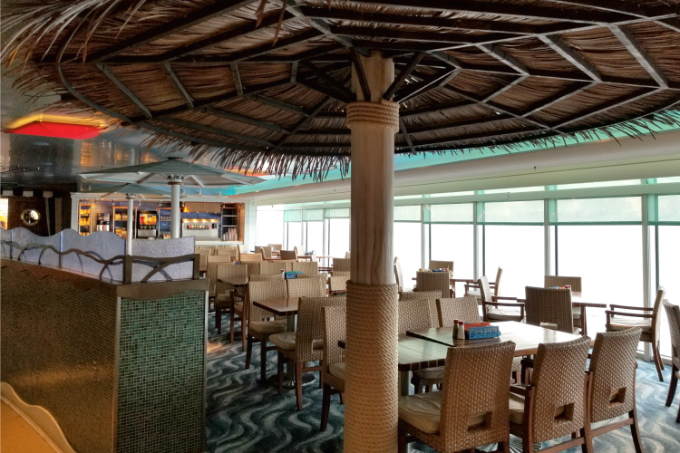 There is no shortage of dining options with the Disney Dream restaurants you can enjoy everything from a fine dining experience at Palo to Mickey waffles at Cabanas. 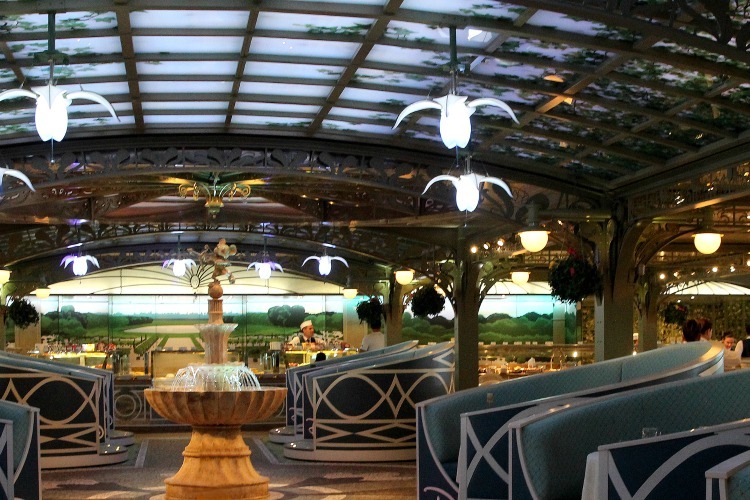 Here’s everything you need to know about dining on the Disney Dream. If your family has trouble agreeing where to go for dinner, Disney makes things easy for you (they love to do that!). Your family will be assigned a dinner rotation and each night you just show up to dine at your assigned restaurant. Not only does it take the guesswork out of where you’ll be eating, dining on a rotation gives you the chance to experience what each restaurant has to offer. Don’t worry if you’re scheduled for the same restaurant twice. 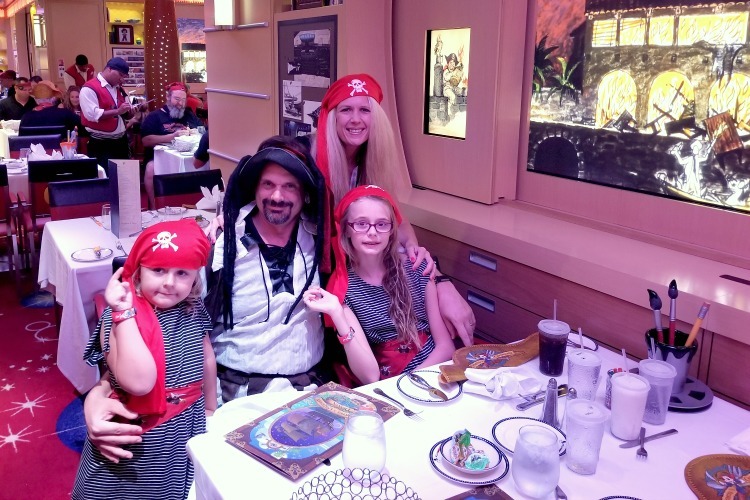 On our cruise, we dined at The Animator’s Palate two times, but since the second night was pirate night, we still had a completely different experience. When you register, you can also indicate whether you’d like the main seating, which falls between 5:45 and 6:15 pm or the second seating, which is between 8:00 and 8:30 pm. 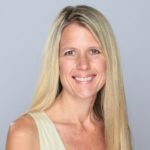 TravelingMom Tip: From my experience, there seem to be more families at the earlier seating while the kid-free adults tend to choose the second seating. The Enchanted Garden has an enchanted ceiling. I thought the Enchanted Garden was the prettiest of all the restaurants. 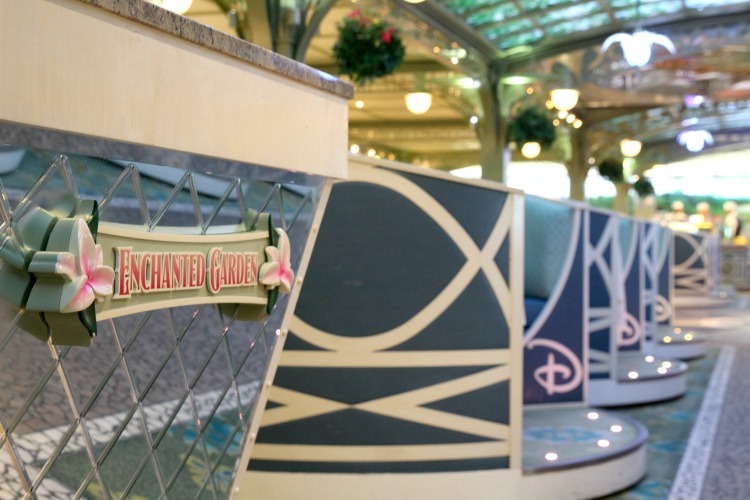 Inspired by the picturesque gardens of Versailles, you’ll find elegant decor, flower chandeliers and a fountain in the center of the dining room complete with a cherub Mickey. What really makes this room enchanted is the ceiling. It changes colors as you dine and you can watch as the “sky” magically changes from blue to the pretty pinks and reds of sunset. By the end of the night, you’ll be gazing into a beautiful night sky filled with stars. You may just find Cinderella’s shoes at The Royal Palace. When you walk into the Royal Palace, you may feel like you’re walking into Cinderella’s dining room. 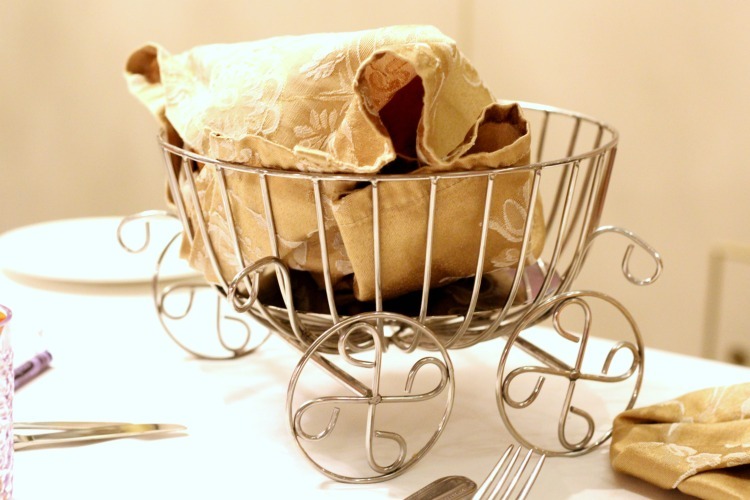 Even the bread comes in a carriage shaped basket. However, no Cinderella story is complete without glass slippers and if you look closely enough, you may just find some. My girls loved this glittering chandelier and the only thing that could have made it better is if they’d actually been able to try on the glass slippers. You may just talk to Crush at Animator’s Palate. If you have kids, this will probably be their favorite restaurant. The screens on the wall come to life with ocean animals and my five-year-old had fun tracking the shark to see where he was going. They also loved guessing what shapes the schools of fish would form next. 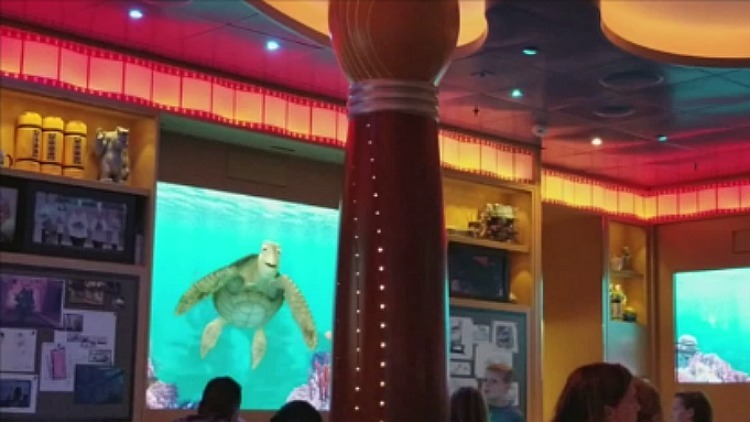 If you’re really lucky, Crush, the laid back sea turtle from Finding Nemo, will “swim” over to your table for a chat. Wear your pirate costumes to dinner! Pirate night isn’t just for the deck party. People came decked out in their pirate outfits for dinner too. In fact, Animator’s palate, where we dined that night, had a pirate themed menu with pirate-inspired food and cocktails. 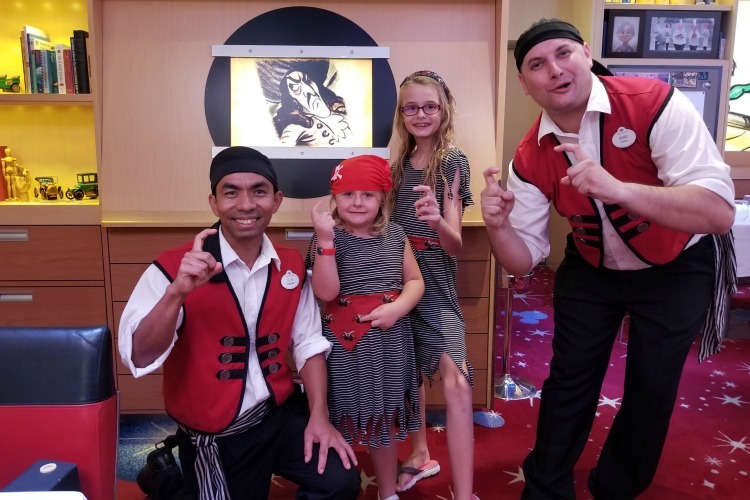 It’s not just the guests that get decked out in their best pirate gear. The entire crew gets in on it! Your dinner experience will really be magical. While my girls loved the food, that wasn’t their favorite part of dinner. 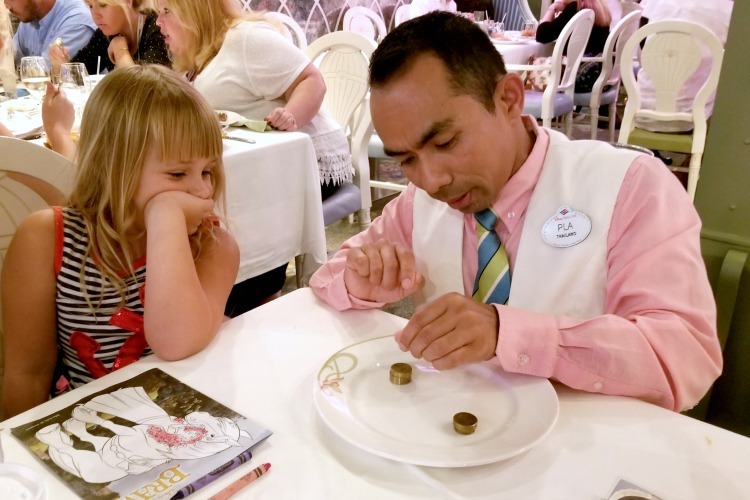 Our waiters truly made dining a magical experience…by doing magic tricks for the kids. The first night started off with flying animal napkins and Minnie Mouse bows. My girls couldn’t wait to go back each night to see what Branko and Pla would do next. They were completely enthralled. Branko and Pla were wonderful and you can tell they genuinely enjoy being around children. My girls were excited to see them every night and looked forward to the magic tricks more than they looked forward to dessert! Palo is totally worth the money. While the restaurants on the Disney Dream are amazing, Palo takes it up a notch further. An adults only restaurant with northern Italian inspired cuisine, this was a real treat for two busy parents who don’t get many date nights. 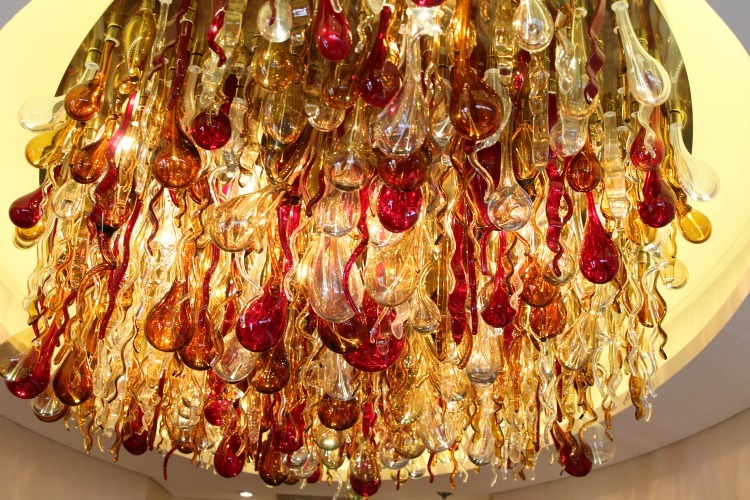 The first thing you’ll notice is the beautiful red and gold glass chandelier in the entryway. 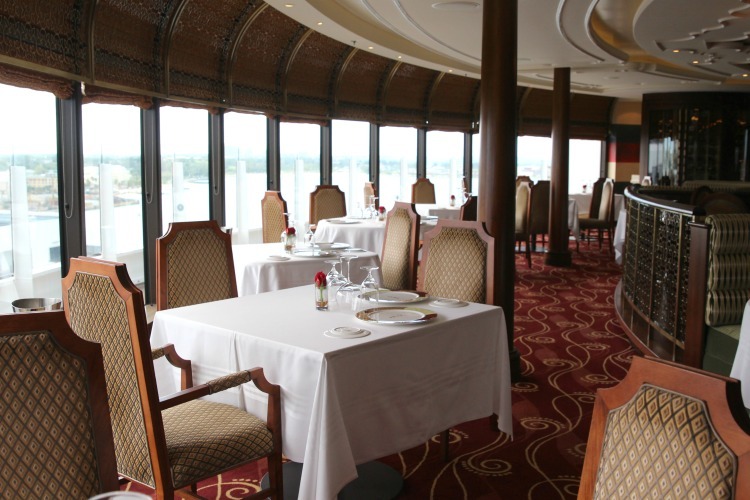 When we were seated, I noticed that the dining room was set up so that all the tables had a view overlooking the water. I knew dinner would be amazing and I was right. It was every bit as good, if not better, as the expensive restaurants my hubby used to take me to in Atlanta! It may cost an additional $30 per person, but we’ve paid hundreds for a meal like this in a regular restaurant. If you’re looking for a romantic date night, drop the kids at the Oceaneer’s Club and head here. Be sure to make reservations ahead of time since this is a popular dining option and if you want the best view, make plans to go at sunset. If you’re going to order the chocolate souffle for dessert, be sure to do it at the beginning of the meal since it takes extra time for the kitchen to prepare. 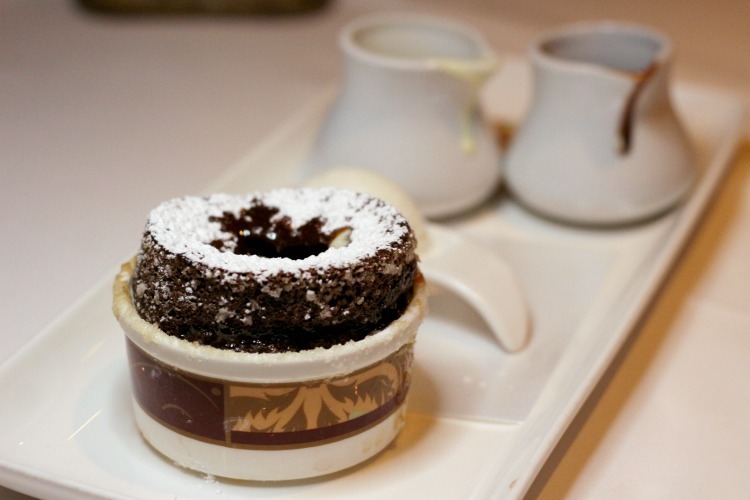 Served with vanilla and chocolate cream, the souffle is a chocolate lovers dream! If you’re a fan of extravagant desserts, I recommend that you try it at least once during your cruise. On the first night, the waiters will ask if anyone in your party has allergies or other special diets. Each of the table service restaurants offers options to those who need gluten-free, vegetarian, no sugar added and dairy free options. If you request it in advance, you can also get kosher meals or other meal options. Our waiters did pretty much everything for us and we felt pretty spoiled. They offered to cut my daughters’ food and pour the ketchup for their fries. 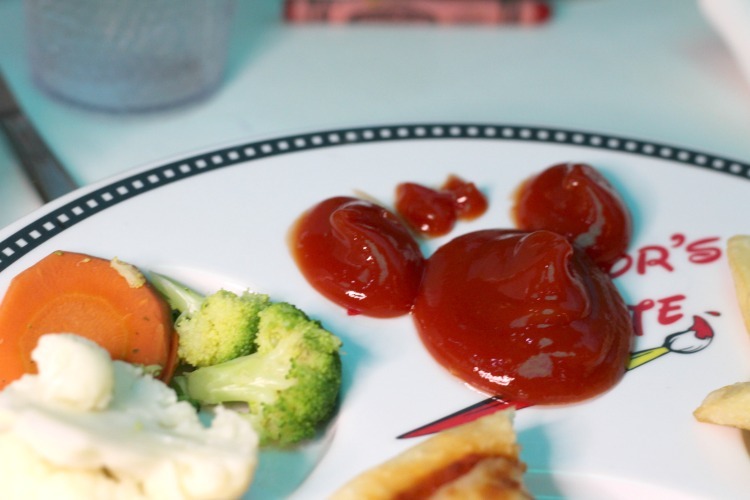 Even when they pour ketchup, they do it with Disney flair and my girls had Minnie Mouse heads for dipping their fries. They don’t save the special treatment just for the kids. Like the ketchup for the fries, squeezing lemons for iced tea also came with a unique presentation. If you ask my kids what their favorite part of the cruise was, they won’t tell you that it was meeting the characters or even riding the insanely fun waterslide. They’ll tell you without any hesitation that the unlimited ice cream at Eye Scream was the best thing ever! I lost track of how many we had eaten but by the end of the cruise, my husband had made an art form of making the tallest ice cream cones possible. Disney may just hide the cones when they see us coming next time! Because it’s usually so expensive, we rarely order room service on vacation. That’s why we were happy to learn that on a Disney cruise, room service is included. While we loved the restaurants, room service is perfect for when you want breakfast on your balcony or if you get back to the room late but need a midnight snack. You can order room service 24 hours a day up until the night before you debark when it closes at 1:30 am. There are no shortage of breakfast and lunch options. If you’re looking for something quick and easy, you can enjoy breakfast at Cabanas. Located on the pool deck. 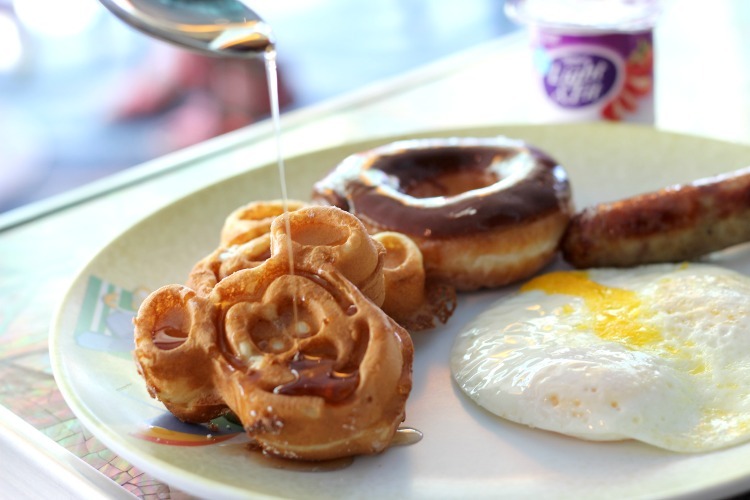 It’s a convenient, buffet style restaurant with plenty of different options to choose from, including the famous Mickey waffles. 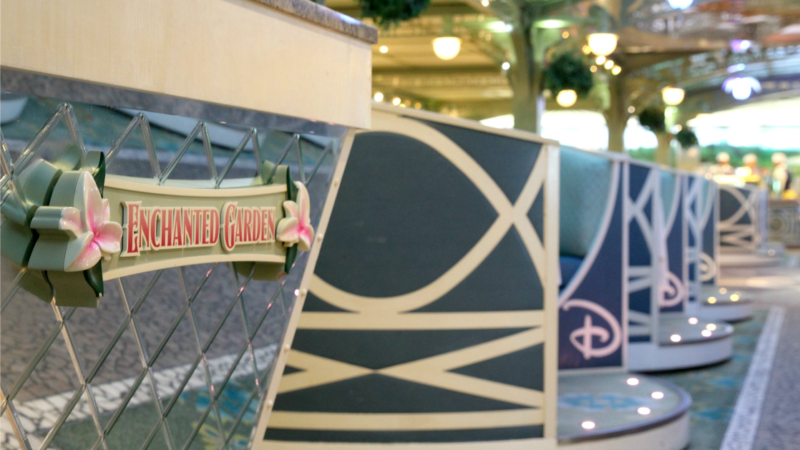 If you’d like something a little more formal, try breakfast at the Enchanted Garden. While it’s also served buffet style, you’ll enjoy the elegant surroundings of the restaurant. 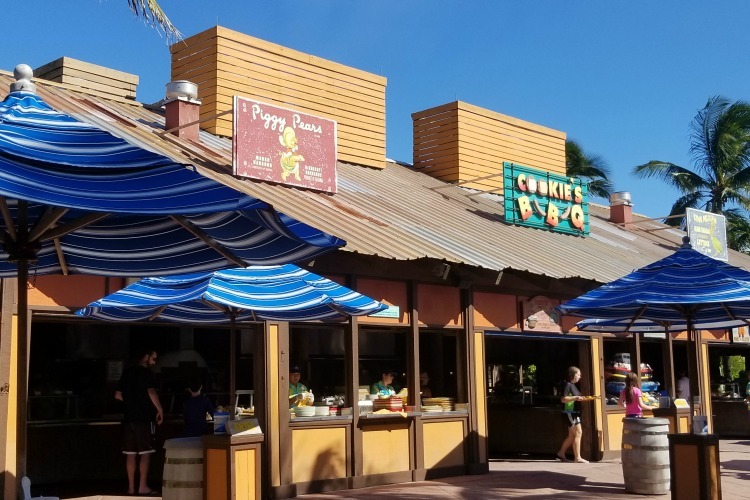 I’d recommend this restaurant if you want to enjoy a nice family meal together, while Cabanas is a great place to grab a quick bite to eat before hitting the pool. 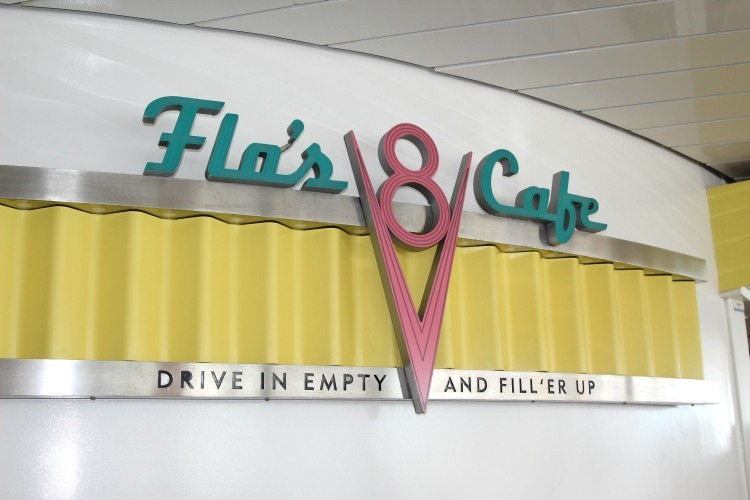 For lunch, there’s everything from casual dining at Cabana’s (where we filled our plates with shrimp and snow crab legs) to Flo’s Cafe Food Court. Here you’ll find Tow Maters Grill (serving burgers, hot dogs and more) and Luigi’s Pizza. You’ll also find Fillmore’s Favorites, which offers wraps, sandwiches, and salads if you’re looking for something on the healthier side. The Royal Palace is open for lunch most days (except the day you board) and there’s even an afternoon set aside for you to enjoy a champagne brunch (for an additional fee) at Palo or Remy. You’ll eat lunch on Disney’s private island. Lunch is served at one of the Cookies restaurants when you spend the day on Castaway Cay. It’s a BBQ buffet with plenty to choose from, including ribs, burgers, fish and lots more. You can also find even more unlimited ice cream, which my daughters discovered immediately. Want to see just how amazing a Disney Cruise can be? Check out this video recap! 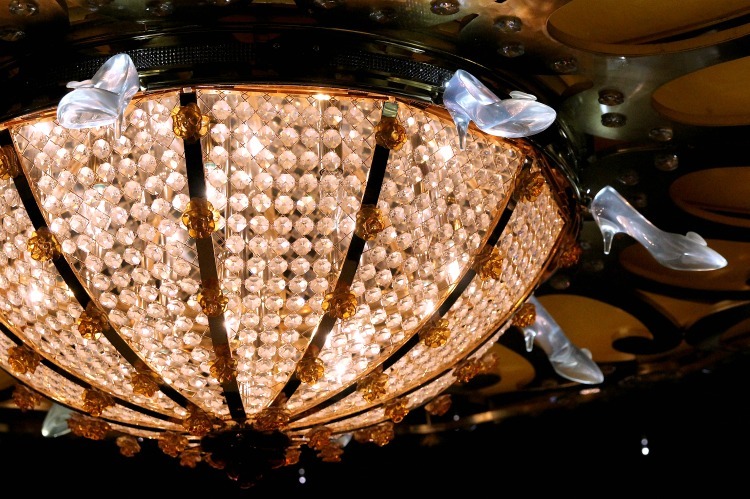 From enchanted ceilings to magic tricks with dinner, dining on the Disney Dream is a unique experience. Not only will you enjoy fantastic meals but the waiters make each and every guest feel special. While there are many things to love about a Disney Cruise, the food will definitely be one of the things at the top of your list. Just returned from a 4 night trip on the Disney Dream. We took our kids and grandchildren and we are all of the same opinion that the cruise was “ok”. Nothing special and certainly nothing spectacular. The one and only place where the toddlers could play in the water was over-run by much older kids who could use the pools. The Disney staff person who was supposed to oversee this was oblivious – clearly just did not care. The food: The description of the food on the menu was really creative. Unfortunately, the food itself did not live up to the hype. It was mediocre and sparse. Three days in a row the bread placed on our table at dinner was stale, which did not include the Eggs Benedict which was drowning in the traditional sauce and placed on an untoasted English Muffin that was so stale you could play hockey with it. 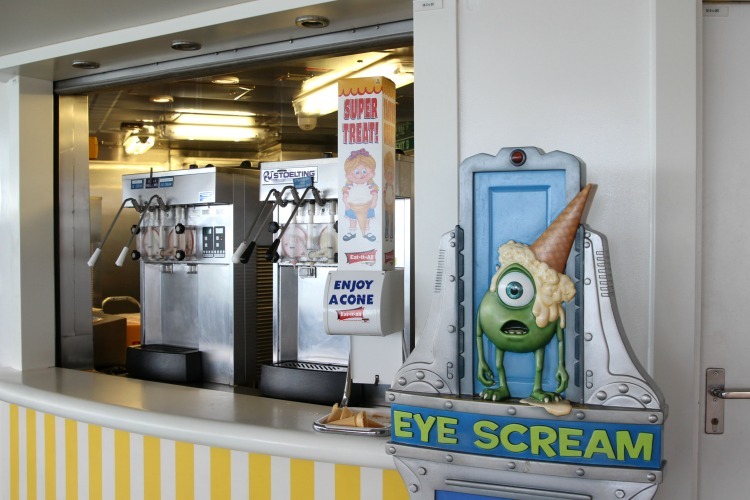 I’d like to send a message to the young lady working behind the Eye Scream Counter – if you don’t like your job, then I suggest you quit. Making faces when someone has a little trouble getting the soft ice-cream onto their cone is so unDisney-like. The Disney Park are soooooo much better. Just curious…Were you having a REALLY BAD week in your personal life when you went on your cruise? My sister and I took our young daughters on a Mommy and Me 5day cruise aboard the Dream. And the ONLY issue I had the entire time was an under-baked potato on our second night. The head waiter quickly came to the table to apologize. The next night, along with the other food I ordered, was a perfectly cooked baked potato dressed exactly how I liked it, without even ordering it. And as far as the food being “sparse”, there’s a reason for this. Did you know that you can order anything from the menu as many times as you wanted? I could have ordered 2 steaks, 3 potatoes, and every desert on the menu if I wanted. Smaller portions allow you to be able to try many different foods if you so choose. As for the girl behind the ice cream counter, maybe she was just reacting to the obviously bad vibes you were sending with your bad attitude.